I love to burn candles, especially during the holidays. They help to fill the house with the aromas of the holidays and gets everyone into that festive mood. I had the opportunity to review a gift set from Old Factory. 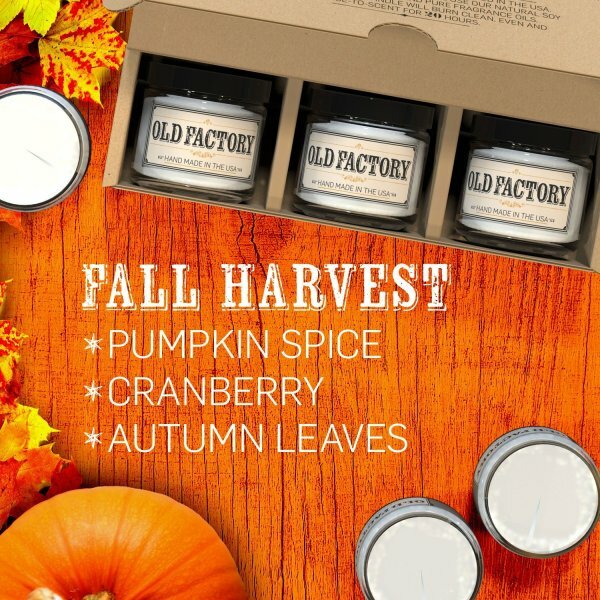 There are 12 different scent combos to choose from and I chose the “Fall Harvest” gift set which included Pumpkin Spice, Cranberry, and Autumn Leaves; perfect for this time of year. The candle combinations are paired together with complimentary fragrances that can be burned together or alone. The candles are hand poured in the USA using natural soy wax. They have self trimming cotton wicks and burn clean for over 20 hours, without soot or smoke, and of course they have a 100% satisfaction guarantee. I was a little surprised by how small the candles were when I unpacked them, but then I realized that soy candles do burn a lot longer than paraffin candles, up to 50% longer. These candles are 2 oz each and burn for at least 20 hours, so the small size really doesn’t matter. I love that these candles are made from soy and have cotton wicks because they burn much cleaner than traditional paraffin wax candles and do not produce smoke and soot. I have burned my candles several times and there is absolutely no nasty black build up of soot around the jar at all. I really enjoy the scents from each of candles. However, the Pumpkin Spice scent is very light and when the candle is lit I really can’t smell it as much as I would like. The cranberry candle has that delicious festive cranberry scent that is so yummy and makes me immediately think of the holidays. Finally there is the Autumn Leaves scent which has an outdoorsy sort of sweet leafy scent. I am actually burning the Autumn Leaves candle now and it even has a bit of a fresh live Christmas tree scent too. I do enjoy burning different combinations of the candles together creating a unique scent. 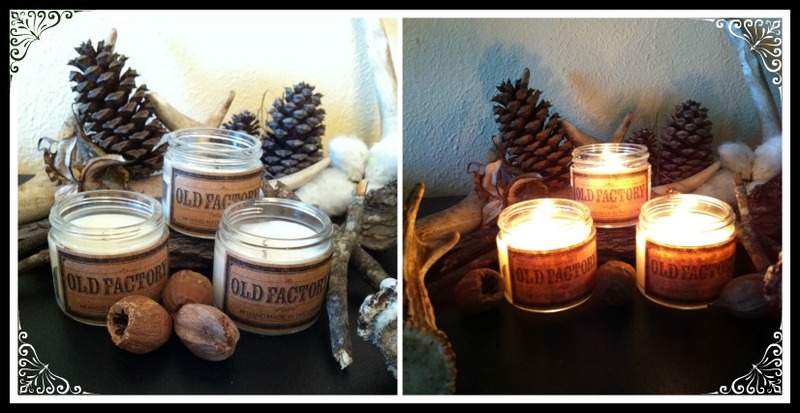 Old Factory will forward the winner an exclusive coupon code for 1 Old Factory Candle Gift Set. They will also reimburse the winner for the shipping and gift wrapping fee. I like the Spa Day scents. they sound fresh and clean! I would pick Winter Wonderland! I bet it smells amazing! I would choose Man Cave. My man’s man cave has a funky smell that needs to be gone. I think i would choose the 50 shades scent, These could be interesting. I might go for something different like Man Cave. The scents like leather & mahogany sound great. I would definitely choose the Winter Wonderland theme 😉 of course, that has nothing to do with it being winter lol! I would choose new born baby since I’m due in April with my first! I would choose Man Cave because of the unique scents! I would choose the Fall Harvest set. I’d pick winter wonderland set since I love chestnut! I think I would choose vacation. Mmmm so many I guess spa day.